van den Top (2011). Small [12" tall x 30" wide]. Light violet flowers mid season. 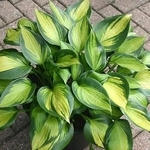 Hosta 'Justine' PP#21624. This tetraploid sport of 'June Fever' PP#15340 has bright gold leaves with narrow dark green margins. A good grower with thick leaves that mature to 6" long by 4.5" wide. A bright location will give you the most color.